The SPN1 is an affordable and effective way of measuring total, direct and diffuse radiation. By using it's combination of thermopiles and unique computer generated shading pattern it is an alternative to shade-ring pyranometers, pyrheliometers and traditional sunshine recorders. It needs no routine adjustment or polar alignment and works at any latitude. The SPN1 Sunshine Pyranometer uses an array of seven miniature thermopile sensors and a computer-generated shading pattern to measure the direct and diffuse components of incident solar radiation. The SPN1 Pyranometer computes direct radiation by subtracting the diffuse from the global (total) radiation. The WMO threshold for bright sunshine is 120 W.m-2 in a plane perpendicular to the direct solar beam. The SPN1 Pyranometer uses an algorithm based on the ratio of direct to diffuse radiation, combined with their absolute values, to estimate sunshine duration to within a few percent of the WMO standard. The SPN1 Sunshine Pyranometer does not need to be adjusted or repositioned to track the sun - a distinct advantage over devices with shadow rings. There are no complex electro-mechanical assemblies and no burnt paper tracks to interpret. 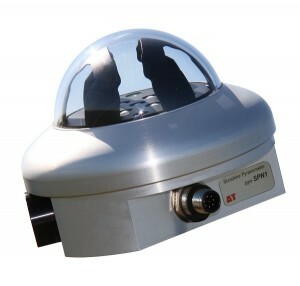 The SPN1 Sunshine Pyranometer provides 2 analogue voltage outputs for global and diffuse radiation, and a digital output for sunshine duration, which can be connected to data loggers. Readings can also be obtained directly from the RS232 port and viewed/logged using the SunData software supplied. Delta-T specialise in manufacturing instruments for plant science and related studies. Products include soil moisture sensors, stomatal conductance, canopy analysis system and solar radiation.